Fernando Alonso passed a final medical examination on Thursday and will be able to participate in the Malaysian Grand Prix this weekend after the Spaniard missed the Formula One season-opener in Australia due to concussion. The double world champion was sidelined following a winter-testing crash in Barcelona last month after leaving Ferarri for McLaren at the end of last season, but has been given the go-ahead to race for a team where he spent one unhappy season in 2007. Alonso flew to Malaysia after coming through tests by three eminent doctors at Cambridge University on Sunday and then passed the official examination by the governing body's medical delegate and the Sepang Circuit's chief medical officer. "During the examination the driver passed all mandatory fitness tests and has thus been declared fit to race in this weekend's Malaysian Grand Prix," the International Automobile Federation (FIA) said in a statement. Considered one of the most skilful drivers in Formula One, Alonso will need to be at his very best around the Hermann Tilke-designed track to have any chance of picking up points on his return to racing for a team that fared poorly in Australia. Struggling for pace and reliability with the new Honda engine, team mate Jenson Button crawled around Albert Park to cross the line last of the 11 finishers, while Alonso's stand-in Kevin Magnussen failed to start the race due to engine issues. "I've been working hard on my fitness and I feel good and ready to go this weekend," Alonso said prior to his departure for Malaysia. "The weekend will be tough but I'm looking forward to getting into the MP4-30 for the first time in a Grand Prix and getting back to racing. Williams driver Valtteri Bottas has also been cleared to race in Malaysia after the Finn missed the Australian opener because of a back injury. 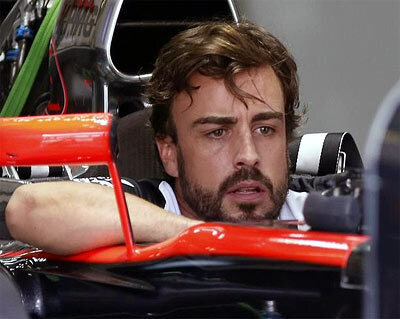 Image: McLaren driver Fernando Alonso.